One of my favorite things about summer is the amazing fruit that you can find at the local farmers markets. 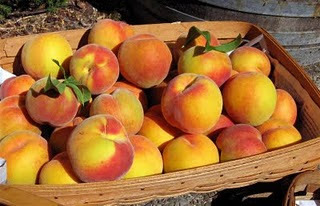 A few months back, at the height of August, peaches were overflowing in every size, shape, and variety. They're one of my favorite fruits and with so many brewers noting the difficulties in transposing the peach flavor into beer, the challenge just seemed too irresistible. Shorts Brewing Company, in Bellaire, MI, is known for their abstract seasonal ales and while I hadn't had a chance to try it yet, their Strawberry Short's Cake became my inspiration. Similar to short cake, peach cobbler contains that bright, fresh fruit flavor along with an irresistible warm bready character layered with just a touch of spice. With a little vanilla ice cream on top, that's one hell of a dessert. For my first attempt at this, I wanted a relatively simple grain bill with a large charge of biscuit malt so that it would shine through and bring out that bready character that's essential to any cobbler. The peaches are the real star though and so for this beer, with lack of experience aging beer on fruit, I wanted give it, what seemed to me, a relatively high dose in order to really impart the peach flavor. After the primary fermentation was complete, I ended up racking the beer onto 9lbs of Suncrest peaches (actual weight inside the carboy) that were at the height of their ripeness. Anytime you use fruit, you run the risk of introducing souring organisms since the fruit themselves are covered in wild yeasts. My intentions were not to create a wild ale, and so I wanted to take every precaution that I could to minimize the risk of introducing some unwanted yeasts/bacteria. I didn't want to heat pasteurize the peaches since in doing so, you'll gelatinize the pectin resulting in cloudy beer. Instead, I took an alternative approach that was a gamble, but in the end, paid off. First, I scrubbed each peach down under warm water and then dried thoroughly. Next, I floated them in a bucket of Starsan for a few minutes making sure that no parts were left unexposed. 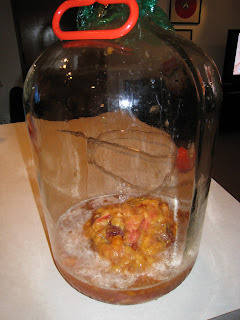 Since I also wanted to break down the cell walls of the fruit thereby making the sugars more accessible to the yeasts, after pulling them out of the Starsan, I placed each in an individual ziplock back which I then stuck in the freezer for a few days. When it finally came time to add the peaches, I removed each from the freezer to thaw for a few hours (while still sealed in their respective bags). In order to get the fruit through the neck of the carboy, I was expecting to have to cut individual slices. However, after removing the fruit from the bag and giving it a quick dunk in a new bucket of Starsan, it basically fell apart in my hands and succumbed to the funnel without so much as a wince. 20 grams Hallertauer (Pellet, 4.1% AA) @ 90 min. 0.5 tsp Wyeast Yeast Nutrient @ 10 min. 1 tsp Irish Moss @ 10 min. 1/2 Tahitian Vanilla Bean (split with scraped seeds) @ 2 min. Collected 7.10 gallons of 1.047 pre-boil wort and ended with 5.5g of 1.060 wort post boil. Chilled down to 65 which took about 25 minutes. Yielded about 5 gallons in the fermenter. Hit with 45 seconds of pure O2 and then pitched the entire 800ml of starter. Fermented at 65 degrees with a solid fermentation starting at about 8 hours. 8/29/2010 - Removed peaches from freezer and via squeezing, placed 9lbs of peach flesh into secondary carboy. Racked over the Peach Fuzz, which at this point, was down to 1.018. 9/29/2010 - Gravity is down to 1.014 and there's plenty of solid peach flavor. Moved carboy down to basement fridge to crash cool and cold condition for a few weeks. 10/22/2010 - Racked over to keg and force carbonated to 2.3 volumes of CO2. 10/30/2010 - Overall, much better than I was anticipating. The aroma is amazing and although the beer itself is complex and inviting, this could be my favorite part. There's a strange essence of warmth...maybe it's the combination of the malt, vanilla, and cinnamon, but it reminds me cookies baking in the oven. The flavor consists of bright peaches with a mild tartness from the fruit (definitely not from contamination) and although the spices add a nice complexity, they're extremely subtle. You definitely can't pick them out. The lactose adds a nice creaminess without making the body heavy. If it were on nitro, it would be unbelievable.